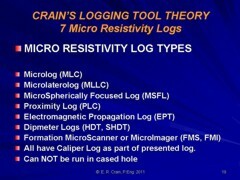 Microresistivity logs are miniature versions of the ES Log, laterolog, and later offshoots of this technology. The microlog arrived in 1948 and the microlaterolog in 1952; both were invented by Henry Doll of Schlumberger. Additional tools were developed to improve performance: the proximity log and microspherically focused log for example. All had electrodes implanted on a small pad pushed against the face of the wellbore. They are designed to measure only an inch or two vertically, with a similar depth of investigation. They can still be run today, but few are, which is a shame as they offer a cheap thin bed log. The resistivity or acoustic image logs are better for the purpose but more expensive to run. All microresistivity logs require a conductive mud in open hole and do not work in cased hole. All microresistivity logs are based on the application of Ohm's Law, adapted for the peculiar geometry of the asymmetry of an electrode arrangement pressed to one side of a well bore. . The Microlog tool is a shallow resistivity device mounted in an oil-filled rubber pad which is pressed to the borehole wall during logging by hydraulic pressure electrically controlled from the surface. The pad can be considered as a miniature electrical survey. It records two resistivity curves and a borehole caliper curve. The illustration below shows the Microlog electrode arrangement. Three small button electrodes (A, M1 and M2), spaced one inch apart, are embedded in the center of the insulated pad. A remote electrode, usually near the pad, is also used serving as the current return electrode B and voltage reference electrode N.
arrangements are miniature versions of LL7, ES, and SFL respectively. Current electrode A is maintained at constant current intensity. The potential difference between electrodes M1 and M2 is used to derive a resistivity curve which is called the micro-inverse and is usually designated R1x1, or simply R1. The electrode arrangement for R1 is equivalent to a lateral-type resistivity tool having a depth of investigation of 1.5 inches. The potential difference between electrode M2 and the reference or remote electrode is used to derive a second resistivity curve called the micro-normal, usually designated R2. The electrode arrangement for R2 is equivalent to a normal resistivity tool and its 2 inch spacing gives it a depth of investigation of two to four inches. The Microlaterolog is a focused, pad-mounted shallow resistivity tool developed to overcome limitations of the Microlog in high resistivity formations and in salt mud situations. The tool design is similar to the Microlog with the exception of the electrode arrangement (see illustration above). The electrode arrangement consists of a current electrode in the center surrounded by focusing electrodes embedded in an oil-filled rubber pad. A remote current return electrode is located near the pad. This electrode arrangement is similar to the seven electrode laterolog on a miniature scale. The tool records a single resistivity curve and a caliper curve. A voltage of constant intensity is applied to the center electrode while a controlled supply of current is applied to the focusing electrodes. The potential difference between the center electrode and the focusing or guard electrodes is maintained at zero by automatic controls. This has the effect of focusing the current into a narrow beam perpendicular to the pad and into the formation. The current beam maintains a uniform shape through the mud cake, spreading out as distance from the pad increases. The potential difference between the center electrode and the remote electrode, in combination with a calibration constant, is a measure of the apparent resistivity of a small volume of the formation near the borehole. The depth of investigation is about three inches from the tool pad. For mud cake less than 3/8 inch thick, the effect of mud cake on tool response is small and can generally be ignored. With flushed zone thickness of two to three inches. The tool reads flushed zone resistivity (Rxo) directly. In wells drilled with low resistivity (salt) muds, mud cake resistivity is usually quite low compared to flushed zone resistivity. Under these conditions the mud cake effect is still small for mud cake thickness greater than 3/8 inch. For fresher muds and higher Rmc/Rxo ratios, the 3/8 inch limitation applies. The Proximity log is a focused, pad-mounted tool and is a further development of the Microlaterolog to minimize mud cake effects. The tool records a single resistivity curve and a caliper curve. The tool design is very similar to the MLLC except for a modified guard electrode arrangement. A second ring of guard electrodes, in addition to those used in the Microlaterolog arrangement, is included. The beam electrode and the guard electrodes also have larger cross-section areas. This configuration is referred to as a shielded guard device. A voltage of constant intensity is applied to the beam electrode. A controlled supply of current is applied to the guard electrode to maintain zero potential between the shield and the beam electrode. The additional focusing shield constricts the current beam from the center electrode even more than with the Microlaterolog tool. A greater thickness of mud cake is thus penetrated with little change in the shape of the current beam from the center electrode. Measurement of the potential difference between the center electrode and the remote return electrode in combination with a calibration constant gives the resistivity of a small volume of the formation. The improved focusing gives the Proximity Log a greater depth of investigation and most of the tool response is received from a distance of six to ten inches from the pad. Field tests indicate that where moderate to deep invasion exists and sufficient flushing has occurred, reliable values for the flushed zone resistivity (Rxo) may be obtained. This log is a focused, pad-mounted tool and is a miniature version of the 9 electrode SFL shallow laterolog. The 4 guard electrodes form a square around the central electrode. This minimizes mud cake effects horizontally as well as in the vertical direction. See image with electrode arrangements near top of this page. The tool records a single resistivity curve and a caliper curve. The Micro Spherically Focused Log (MSFL) has superseded the Proximity log. It has the general electrode arrangement of the SFL described earlier, placed on a pad in miniature form. The MSFL is the current tool of choice for flushed zone Rxo measurement. ES log (left) with Microlog (right). Shaded areas show “positive separation” where 1” inverse (solid line) is less than 2” normal (dashed line). This is an indication of porous, permeable reservoir rock. High resistivity is tight; low resistivity with no significant separation is shale. Micrologs are still run routinely today and are still a great reservoir finder.